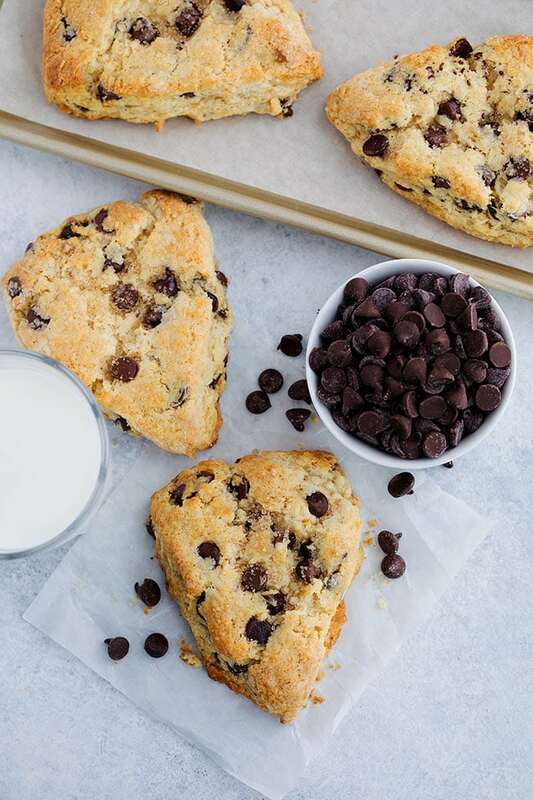 Chocolate Chip Scones-these soft and tender scones are dotted with chocolate chips and will remind you of a chocolate chip cookie! One of our favorite treats to enjoy for breakfast, brunch, or dessert! Scones and chocolate chip cookies are two of my favorite things to bake and eat so I decided to make Chocolate Chip Scones. Yes, a scone that tastes like a chocolate chip cookie. Are you with me? The combo is insanely delicious. 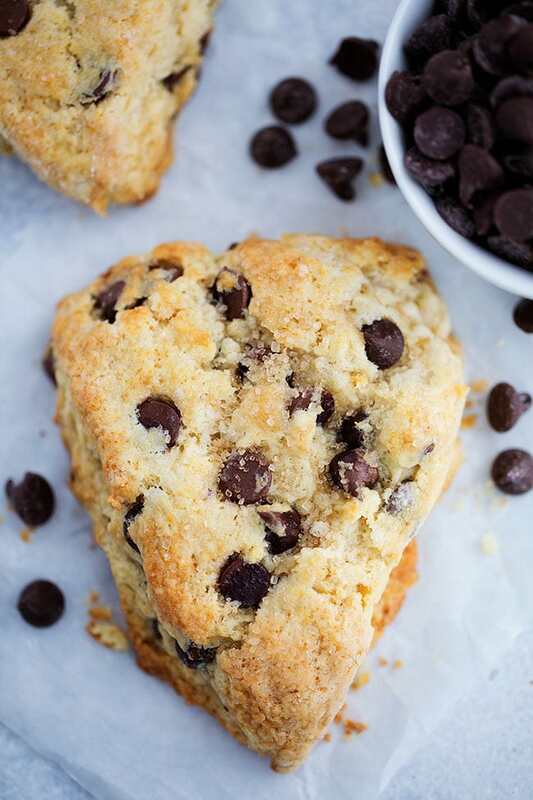 Think soft, tender, fluffy scone with sweet chocolate chips. The scones are melt-in-your mouth good and will cure all of your chocolate cravings. I am in LOVE with this scone recipe! 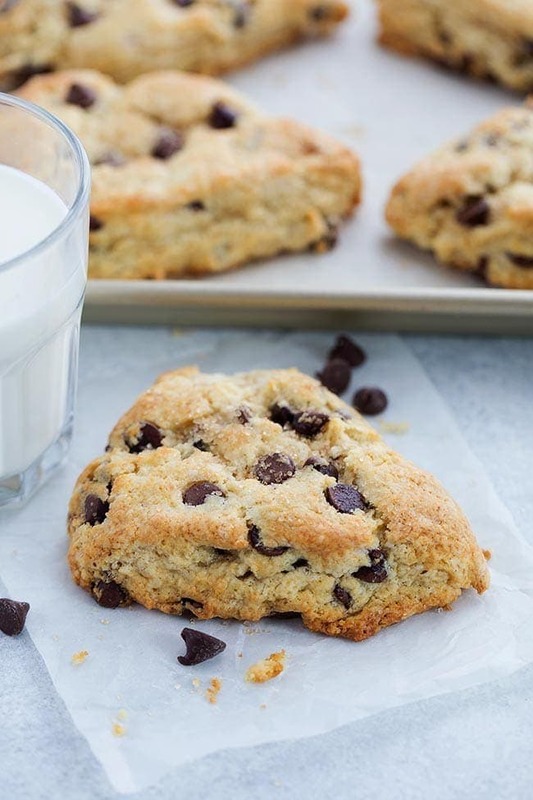 These chocolate chip scones are perfect in every way. I promise they aren’t dry at all, nobody likes a dry scone, and these scones are rich and buttery. If you like chocolate chip cookies, I know you will LOVE these scones! 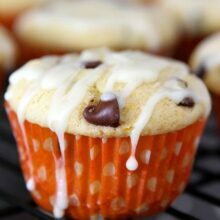 Whisk together the flour, granulated sugar, brown sugar, baking powder, baking soda, and salt. Whisk well to make sure there are no brown sugar clumps. 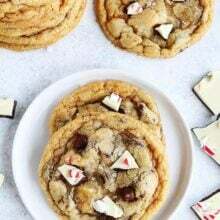 I love using granulated and brown sugar in this recipe because the brown sugar brings out that chocolate chip cookie flavor. Make sure your butter and heavy cream are COLD. Keep these ingredients in the refrigerator until you are ready to use them. Add the pieces of cold butter to the dry ingredients and lightly toss until all of the pieces are coated. Using a pastry cutter or your fingers, quickly cut the butter into the flour mixture until the mixture is pebbly. You want there to still be little chunks of butter, about pea size. The little butter chunks are a GOOD thing! Pour the cold liquid ingredients over the flour butter mixture and stir with a fork. The scone dough will be wet and sticky. Stir in the chocolate chips. I like to use semi-sweet chocolate chips, but if you like milk chocolate, go for it. Knead the dough a few times until the dough comes together. Don’t over mix the dough or you will end up with tough scones instead of light and tender scones. You want to see chunks of butter and some flour pockets. Place the scone dough on a lightly floured surface. Gently pat and shape the dough into a 3/4-1-inch thick circle. Use a sharp knife to cut the scones into 8 even triangles. Place the scones on the prepared baking sheet and brush with the remaining heavy cream. Sprinkle the scones generously with turbinado sugar. If the scones are soft and have heated up too much, place the baking sheet with the scones in the freezer for 15-20 minutes before baking. I usually do this just to be safe. If the scones are warm, they will spread. You want the scones to be super cold so they will get tall in the oven. Bake until the scones are golden brown around the edges and on top, but still slightly soft in the center. Let the scones cool on the baking sheet for 5 minutes and then transfer to a wire cooling rack. The scones are best the day they are made, but you can keep them in an airtight container for up to two days on the counter. You can also freeze the scones. After they are cooled completely, place in a freezer bag and freeze for up to one month. Defrost before eating. You can also freeze the scones before they are baked. 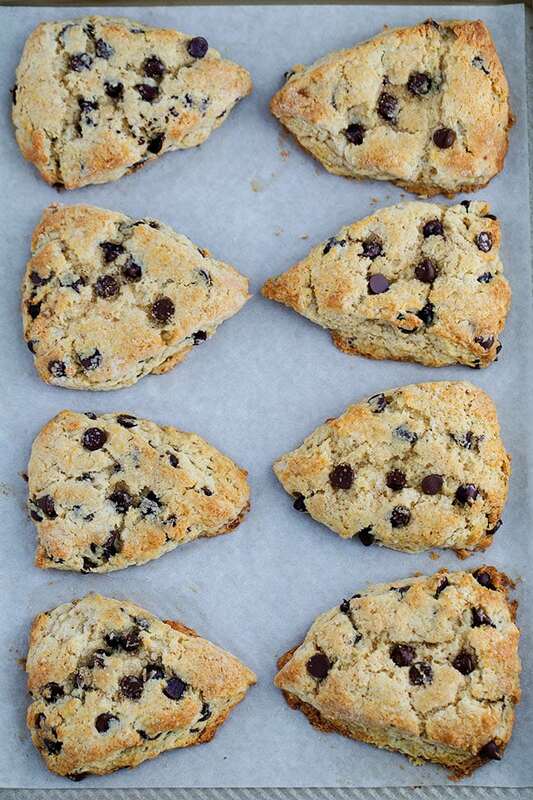 Cut the scones into triangles and place on the baking sheet. Freeze the scones until they are frozen solid. Place the scones in a freezer bag and freeze for one month. When ready to bake, remove the scones from the freezer and preheat the oven. Place the scones on a baking sheet with parchment paper and bake. It might take them a few additional minutes. Enjoy with a cup of tea, coffee, or dunk your scone in a glass of cold milk. My kind of breakfast! These scones also make a great sweet snack or dessert! They really are good anytime of the day. 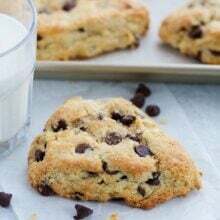 These Soft And Tender Scones Are Dotted With Chocolate Chips And Will Remind You Of A Chocolate Chip Cookie! One Of Our Favorite Treats To Enjoy For Breakfast, Brunch, Or Dessert! 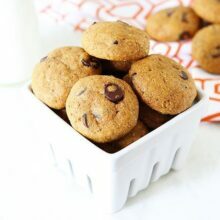 In a large mixing bowl, whisk together flour, sugar, brown sugar, baking powder, baking soda, and salt. Set aside. Pour the cream mixture over the dry ingredients and use a fork to gently stir together. Don't over stir, the mixture will be wet and sticky. Stir in the chocolate chips. Still in the bowl, knead the dough a few times until the dough comes together. Place the scone dough on a lightly floured surface. Gently pat and shape the dough into a 3/4-1-inch thick circle. Use a sharp knife to cut the scones into 8 even triangles. Place the scones on the prepared baking sheet and brush with the remaining heavy cream. Sprinkle the scones generously with turbinado sugar. If the scones are soft and have heated up too much, place the baking sheet with the scones in the freezer for 15-20 minutes before baking. I usually do this just to be safe. 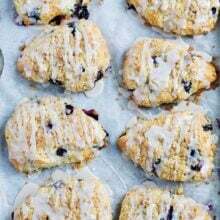 When ready to bake, place the baking sheet in the oven, on the middle rack, an bake for 17-22 minutes or until the tops and edges are golden brown and the scones are set but still slightly soft in the center. Remove from the oven and let the scones cool on the baking sheet for 5 minutes. Transfer to a wire cooling rack and cool completely. Hi! Can you use whole milk instead of heavy cream? Sure, the scones won’t be quite as rich, but still good! Hi Maria and Josh, thanks for sharing this recipe! I have never made scones before as I don’t like raisins but your recipe with chocolate chips is such a tasty alternative!